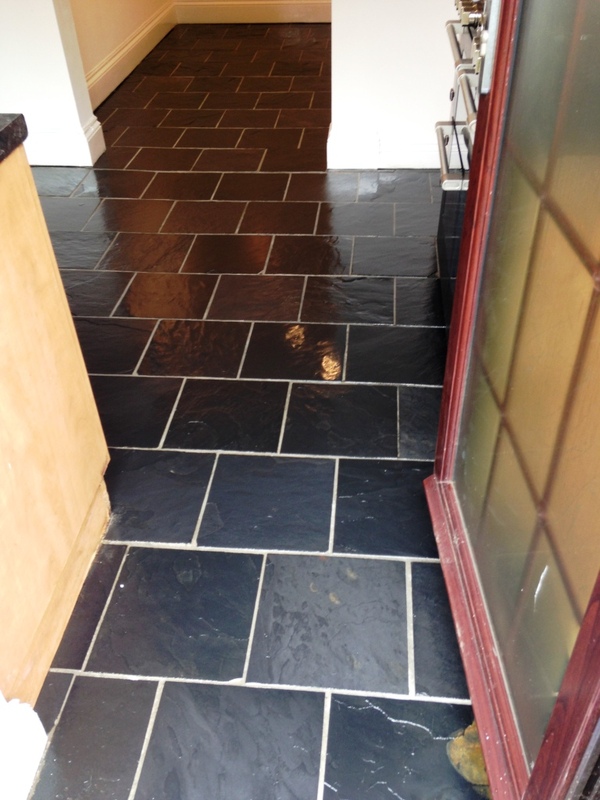 This Slate tiled floor at this house in the Pontypool was laid over ten years ago in the kitchen/dining room. 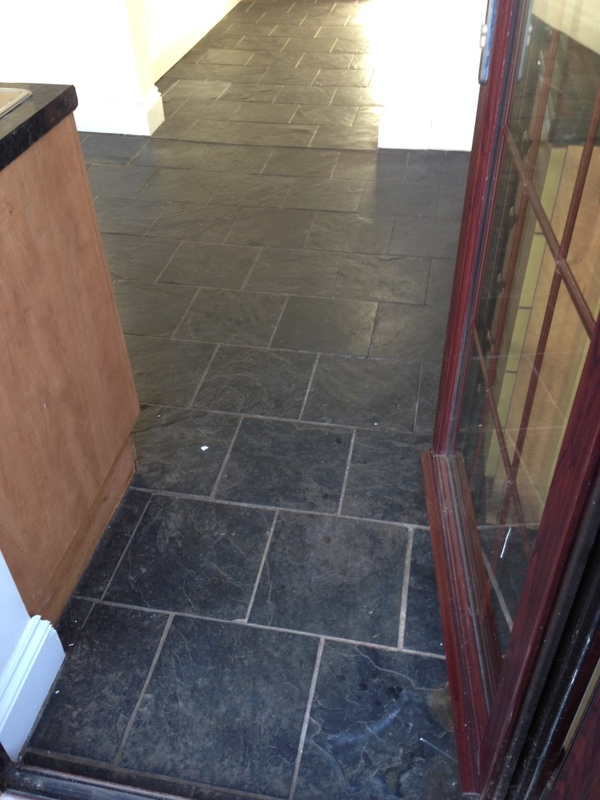 The floor had ground in dirt into the tiles and grout which the client wanted brought back to life. I could see the tiles would need to be deep cleaned so I started the cleaning process with a strong combination of Tile Doctor Remove and Go to strip away the old sealer and Tile Doctor Pro-Clean to get the tiles as clean as possible. The solution was scrubbed into the tile and grout using a rotary machine fitted with a black 17” scrubbing pad. The floor was then rinsed with water and the soiled residue was extracted with a wet vacuum. This process was repeated until I was satisfied all the sealer and dirt had been removed from the tile and then I concentrated my attention on the grout lines using more Pro-Clean and a stiff wire brush to get them as clean as possible. With the tile and grout as clean as it was possible to get it, I gave the whole floor a final rinse to neutralise the cleaning products and then extracted as much moisture as possible from the floor with a wet vacuum and left the floor to dry overnight. When I returned to the property I made sure the floor had dried by checking for any dampness with a damp meter. If you neglect to remove all excess moisture from the surface of the tiles before sealing it will impact the effectiveness of the sealer. Once satisfied that the floor was completely dry, I proceeded to seal the tiles using Tile Doctor Seal and Go which will protect the floor from staining in the future and adds a nice sheen to the surface. 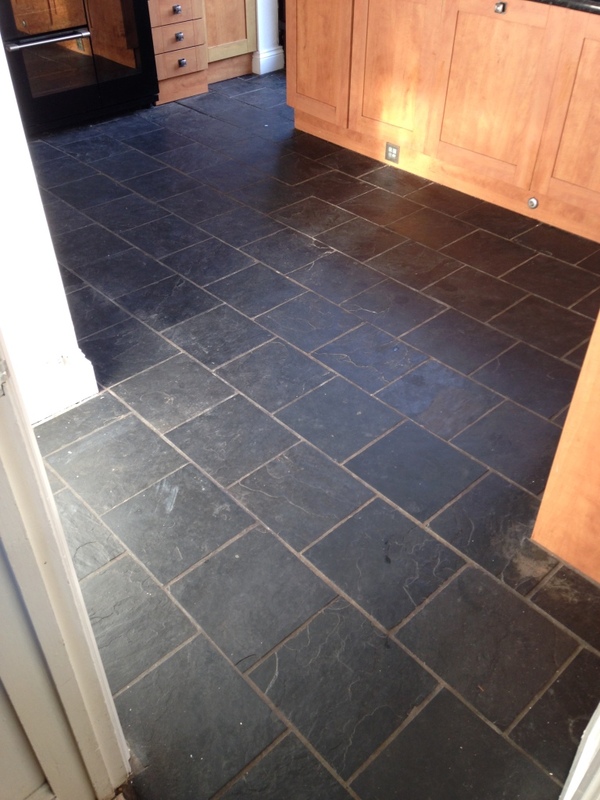 The Slate was quite porous so I found eight coats of sealer were needed to fully seal the floor. I think you will agree the floor now looks amazing! 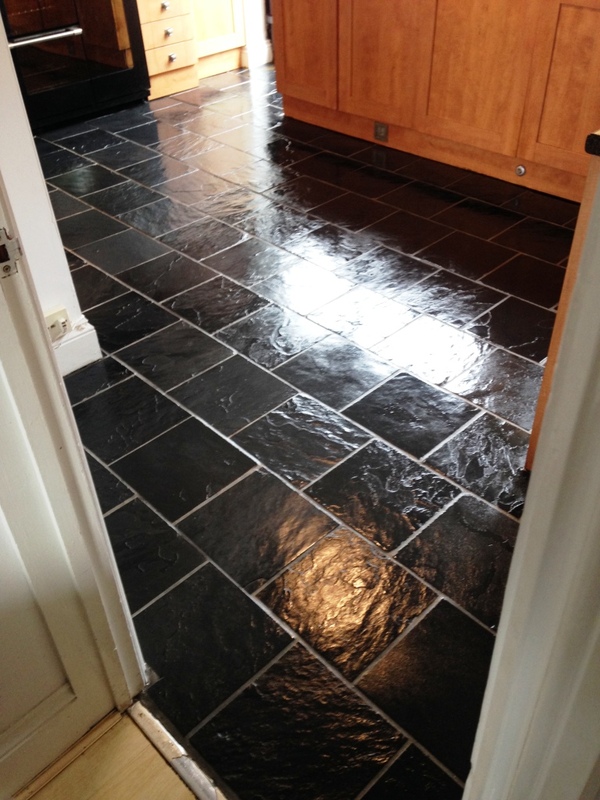 This entry was posted in Slate Tile Posts and tagged dining room, kitchen, monmouthshire, pontypool, slate tiles, tile cleaning, tile sealing by AbzDominise. Bookmark the permalink. Paul Wales is an agent of Tile Doctor, the largest Tile and Stone cleaning network in the UK who have developed the products and techniques to handle a multitude of issues surrounding tiled flooring including stone and grout.